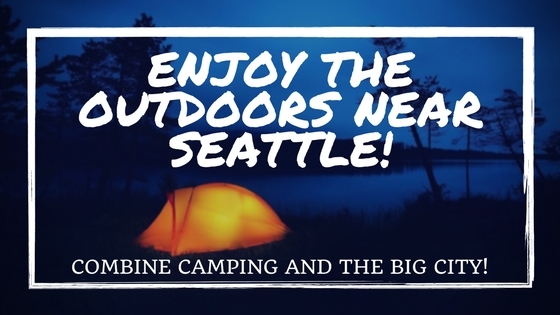 Combine camping in the great outdoors with the big city Seattle experience for a quintessential Pacific Northwest Experience. A big part of Seattle is our love of the outdoors. It is a part of the culture of the city, and establishments like REI, Fulson, K2, and Eddie Bauer got their starts here, and use our outdoor spaces as their training courses and testing grounds. One great way to have a quintessential Northwest experience is to combine your big city Seattle visit with some time spent outside the city. Camping season is upon us, and enjoying the great outdoors without "roughing it" is easier than ever! First off, outfitting yourself isn’t as tiresome as you might think. For those road tripping, the folks over at Wonderful Wellies have a fantastic camping checklist, which I actually have printed out portions of, myself. It really ensures you won’t forget a thing! For those flying in, you’ll be happy to see that all of my recommended locations, below, have both tent campling as well as cabins, yurts, or some kind of glamping, so that sleeping under the stars can have less "roughing it" in the equation! If bringing even just sleeping bags is not an option for you, you still can have that Washington State camping experience. Check out a camper van or RV rental that will have you completely outfitted as soon as you step off the plane. Escape Campervans have very reasonable rates, Peace Van Rentals specialize in VW vans, and of course there is Cruise America.